Any injury that affects the bones, muscles, ligaments, nerves, or tendons resulting in pain are considered musculoskeletal injuries. While pain may be widespread and affect the entire body, it is often localized in the hands and wrists due to their high use and exposure. Acute pain often stems from injuries like a fall, sprain, dislocation, or a direct blow to the muscle. Musculoskeletal pain may also be chronic. Some of the most common forms of musculoskeletal pain stem from the overuse of the fingers and wrists at home or in the workplace, but poor posture habits or prolonged immobilization of a joint can lead to chronic pain as well. The sensations felt often vary depending on the location, type, and severity of the injury. Pain is often described as an aching feeling as though the muscles are being pulled or worked beyond exhaustion. Other symptoms may include prickling sensations, burning, twitching, or sharp pain; this also can vary greatly from person to person. People suffering from musculoskeletal pain may also feel fatigued or even experience difficulty sleeping. Arthritis – Defined as inflammation in a joint, arthritis is one of the most common forms of extremity pain. Osteoarthritis is caused by a wearing of the joint over time, or through repetitive stress. 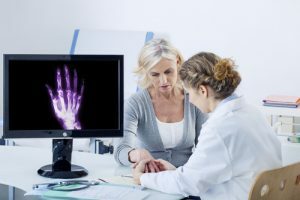 Rheumatoid arthritis, on the other hand, is one of many autoimmune conditions in which the body’s immune system attacks healthy tissue, causing joint inflammation. Inflammation – This is a very common condition that can affect tendons and joints from overuse and or trauma. Tendonitis is one type of inflammation when tendons irritated and swollen. Repetitive strain – When somebody performs repeated or prolonged motions for long hours especially when not previously conditioned either at work, home or during other activities, they are put at risk for a repetitive strain injury. Examples of this might include writer’s cramp wrist pain from painting. Fibromyalgia – This is an uncommon condition that is poorly defined in the medical industry. It involved lingering, nagging muscle and or joint pain; fibromyalgia is often in multiple areas of the body and can be difficult to describe. Symptoms may even include fatigue and trouble sleeping. Treatment is often dependent on what caused the injury and pain, whether it be an injury to bone, muscle, tendon, or the joints. If you’ve been experiencing acute or nagging pain as a result of injury, use or on a chronic basis in your hands or wrists, the medical team at Orthopaedic Associates of St. Augustine is here to help. Request an appointment, or call us today at 904-825-0540.